Britain in 2019 doesn’t feel quite like Yugoslavia did 30 years ago, but then again Yugoslavia didn’t feel like Yugoslavia until it became the former Yugoslavia. Brexit is pointing to the end of the UK. The surface unity of the May-Corbyn truce is nothing but a marriage of convenience forged in desperate circumstances. Long-term, we face something bigger than the UK leaving the EU: we face the potential Balkanisation of the United Kingdom. A looser federation, which is the obvious implication of Tony Blair’s 1990s’ devolution initiatives, constitutes the minimum expected disruption. One of the less extreme outcomes is that Scotland ends up like Quebec, a semi-autonomous province, but that mightn’t go far enough for the SNP, particularly if, post Brexit, the EU’s full membership is on the table. Meanwhile, the Belfast Agreement will hold, with all its attendant demographic implications. Constitutional rupture can happen peacefully, as in the Czech and Slovak divorce, or it can end in chaos as in Yugoslavia or Ireland 100 years ago. Brexit has been the slow part. The quick part, the next phase, will depend on the quality of political leadership, and right now there is not much of that on display, except perhaps in Scotland. History might conclude that the EU was the very thing that kept the early 21st-century UK together in the face of the various nationalist pressures. Whatever the blueprint, the coming years will be turbulent politically in what we now call the UK. There will be lots of soul-searching, and it could lead to the peaceful rearrangement of Britain’s nations, at a pace set by an indignant English nationalist faction that could emerge out of the Tory split – another likely outcome of Brexit. Unneighbourly as it may be to declare, this presents a unique, once-in-a-generation, opportunity for the Irish economy because turbulent countries, such as the former UK, will scare capital and talent away. Capital moves like water, following the path of least resistance. Talent comes to where it is most welcome. Brexit throws up barriers to both. A Corbyn government would penalise capital; a Brexiteer Tory one would deter foreign talent. Where is this capital and talent that wants access to the EU going to go? Ireland is set to benefit enormously because, economically, Ireland is a modern, tolerant cog in the globalised world, profiting from the flow of capital, knowledge and talent. Brexit is an act of aggression against this global system. Ireland, as a fully paid-up member of the EU, is plugged in to the global via multinationals with their peripatetic workforce and its door is open to the business, knowledge and talent that is set to flow in here. If that door does not stay open, that talent and business will go elsewhere, and the Brexit dividend for Ireland will be lost. It’s really that simple and that urgent. If Ireland is too expensive, knowledge will go somewhere else. One thing that makes Ireland unattractive is expensive land; it sets the high price for everything else. We urgently need to fix the feudal grip that expensive land and housing have on our economy and society. Inflated land and property prices are – by a country mile – the biggest threat to Irish prosperity. In the modern world, land (unless it is farmed) is the least productive economic resource. Its price should be falling relative to wages. Wages are the return to workers. As we educate people and their productivity rises, wages should rise relative to land prices, because land creates nothing. People and knowledge combined create everything. Therefore, in a modern society, land should be cheap compared with other economic resources; but in Ireland it is made artificially expensive because it is not taxed properly. Instead, it is supported by restrictive planning laws and it is used by the banking system as collateral, giving land a ridiculously inflated value. This feeds into rents and house prices, driving them both up to silly levels in a country that still enjoys the lowest population density in western Europe. Expensive housing, land and rent in Ireland constitute a manufactured heist inflicted on workers by landowners. It is fabricated by the intersection of planning, finance, political expediency and vested interests. On a human level, this crisis plays out at one extreme where you have homelessness, and at the other, where working people pay up to 60 per cent of their income on rent. This is abnormal in an international context. It is important to appreciate how far out of whack is Ireland on the property/land front. In the US, the Federal Housing Association and other public bodies have long deemed housing expenditures that exceeds 30 per cent of household income as an indicator of an affordability problem. 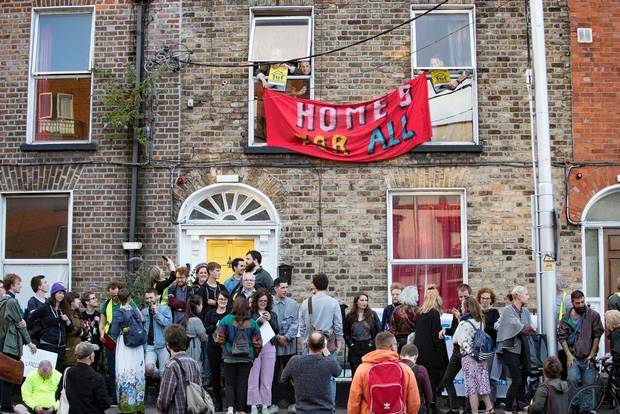 Ten per cent of people renting in Dublin are paying twice that. We are way out of line. And, of course, the surplus is skimmed off by a landowning class that does nothing but sit back and take the rent. This is feudalism; but more egregiously it is legislatively-enforced feudalism. Feudalism is the antithesis of the modern economy. Now let’s go back to the Brexit dividend and the likely flow of capital, talent and knowledge in to Ireland. If we let landowners rather than skilled workers snaffle the coming Brexit dividend, we will miss this enormous opportunity. Highly successful trading countries such as Singapore figured out this land-vs-wages conundrum years ago. Today 85 per cent of the land in Singapore is owned by the government, so as to prevent land prices inflating too much and to prevent private landowners grabbing too much of the national wealth, which depends on trade not land. When the latest iteration of the Brexit saga passes, we will see that the long-term economic implication is that many investments that used to go to the UK will come to Ireland. Britain will be engulfed in its own identity crisis and will trade with the EU on less favourable terms. The North will ultimately get regulatory alignment with the EU because the DUP’s hour of power will have gone. Electorally, it’s hard to see them having such disruptive sway again. The urgency for Ireland is to fix our land-based feudalism once and for all and join the 21st-century global economy, garnering the Brexit dividend for the good of the many, not the few.